Got a new toy. Yay! 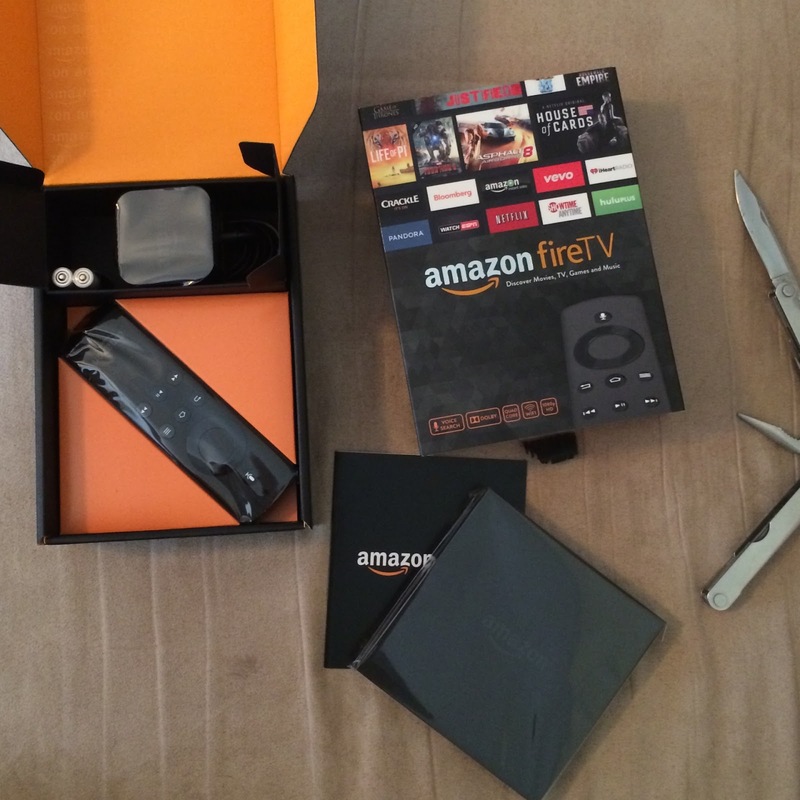 This week, Amazon introduced a streaming box. They call it the Amazon Fire TV. Now, I already have a Roku. And an Apple TV. And a Chromecast. Oh, and a TiVo. So, why do I need another streaming device? Well, I don't. But I got one anyway. And, I spent a good deal of last night looking it over, trying it out. I opened the box, hooked up an HDMI cable (not included), plugged it in, and was ready to play. Of course, there's the updates that it has to download. Seems even a brand new item -- released on Wednesday, connected on Thursday -- has to have updates. So, there's that irritant. But, the device itself? Yeah, it's a good little streaming box. Couple of things I noticed. The remote has no dedicated 10-second rewind button, like you get on Roku. Rather, the standard rewind mode is in 10-second leaps. To rewind 10 seconds, you have to hit rewind and then very quickly hit Play. At least, on Hulu Plus and Netflix, you do. On Amazon content, pressing Rewind a single time (a single click) achieves a 10-second rewind. Not a major deal, just something to get used to. The selection of apps is kinda sparse, compared to Roku, but it has more available than Apple TV, although there is not a complete overlap. It does have Netflix, Hulu Plus, WatchESPN, Vevo, Vimeo, YouTube, Crackle, Bloomberg, Pandora, iHeartRadio, Showtime Anytime, TuneIn Radio, Plex, plus a decent selection of games. Some major missing channels include Sky News (Roku, Apple TV), The Weather Channel (Apple TV), PBS (Roku, Apple TV), WWE (Roku, Apple TV), Yahoo! Screen (Roku, Apple TV), HBO GO (Roku, Apple TV), Watch ABC (Apple TV), MLB.TV (Roku, Apple TV), VUDU (Roku), Dailymotion (Roku), and some others. Oh, about the games. I don't care about games. But, if you like playing games, it lets you. There's an optional game controller you can buy, if you want to play games. I don't. But you go ahead. Again, Roku is king of content. It has almost everything, including a lot of stuff with limited appeal. Apple TV has limited content, but most of it is good content with wide appeal. Amazon Fire TV is closer to Apple TV in the limited content, but most of the good stuff, but it seems it really wants to be Roku. Hulu Plus and Netflix, two of the biggest subscription services, don't come pre-loaded. But, they're easy enough to find and add. Especially if you already have them installed on a Kindle Fire tablet. Even if not, they're easy to find. Both work similar to the way they work on Roku. The experience of navigating the menus is consistent. Once difference is that, unlike Roku, you do have the "Play from beginning" option on Netflix content. The Amazon Fire TV is also very responsive. You press a button, it responds. Quickly. They do a very good job of integrating the non-Amazon content in the menus. For example, on Roku, if you go to Movies or TV on the Main Menu, you are essentially in the M-GO app. However, on the Fire TV, while the emphasis is on Amazon, you also get access to non-Amazon content. For instance, I've been watching the old Doctor Who episodes. So, when I go to TV, then scroll to "Your TV Shows" section, I see shows I own or have in my Watchlist, including The Mentalist, Star Trek, Major Crimes, and, of course, Doctor Who. When I select Doctor Who, I see episodes that are on Amazon Prime, and episodes that are on Hulu Plus. I didn't see any Netflix episodes, but I think that's because all the episodes available on Netflix are also available on Amazon Prime. Again, they did a good job of integrating non-Amazon content into the menus, but only for content that other services offer they Amazon doesn't. Let's get right to it: is it worth it? Well, if you already have a Roku or Apple TV, it would be hard to make the case for a Fire TV box. It makes more sense to add it to an Apple TV setup than it does a Roku setup. But replace either? I wouldn't give one up for it. If you were interested in your first streaming box, I'd still recommend a Roku (particularly the Roku 3), if I had to pick just one. But, if you chose an Apple TV instead, you'd be making a good choice. And, now I'm comfortable saying that if you chose Amazon Fire TV, you'd be making a good choice. Before this week, online streaming boxes were Roku, Apple TV, and then everybody else. Now, it's Roku, Apple TV, Amazon Fire TV, and then everybody else. I have Roku - but I like just about everything Amazon. I was wondering if it was worth putting down $100 for the Fire TV. Looks like I'll just stick with Roku and spend the $100 on tuna. instapundit talked about this the other day. i pointed out that it requires hi-def tv whereas my roku 2XD doesn't. this seemed to be a source of both amusement and outrage, but for those like me who do not have HD tv Fire TV won't work (as nearly as i can tell). http://www.feed2all.eu/ into my tv via roku? ever consider salmon? just asking. There are several new streaming boxes out now. One is called "Fire Your TV" and the other is called "Tuna." But apparently, the "Tuna" enclosure is radically different. I'm sure you know this, but for others that don't but are interested, using an HDMI connection vs a composite connection (red,white audio; yellow video) has no bearing on the content. If you can get it on the box, it'll take care of formatting it to your TV. But, to your sports question. All streaming boxes suffer from the lack of live sports. Maybe a full, separate post on the challenges would be in order. Do these streaming boxes, in effect, turn "dumb" TVs into "smart" TVs? If you use these streaming boxes and a digital antenna could you theoretically get rid of cable? It gives you apps, much the same way a Smart TV does. Hulu Plus, Netflix, bunchastuff. In 2010, I bought an Apple TV (for wife) and a Roku (for me). I waited until January 2011 to cancel cable. Didn't add an antenna until the Fall (SEC football on CBS). Everything non-sports I wanted to see (except Fox News Red Eye) was available online. so far i'm stuck watching on my laptop, though. until Basil tells me how to get it to my non-HD tv. oh, and don't download anything at either site. just click the numbered links. That's my second Leatherman. Lost my first one in Kuwait. A couple weeks later, one of those rolling PX trucks came by, and I bought that one. I've done a better job of keeping up with it than I did my first one. I have not used it. It's specs are more like the older, second-generation Roku boxes (like the Roku 2XS). Less than the current lineup of Roku 1 and Roku 2 models. The most effective way of getting output from your computer to your TV isn't through a Roku box. Now, certain applications on a phone or tablet (Netflix, Chromecast) will let you cast the content to your Roku (actually, they launch the content on the Roku channel, but still allow you to control it via the device, as well as via your Roku remote). But there is no mirroring capability of your computer desktop to a Roku. So, how? Well, you can connect your computer to your TV. Now, if your desktop doesn't have a second video output, you can add one. Or, if it's a laptop, many have video outputs. Depending on the output, you can run a cable to your TV. If you need a VGA to composite adapter, or a DVI to composite adapter, you can get those at Amazon or on eBay or at Best Buy or other such places. After a bit of get this, get that, you're talking more money than you want to put into it. Heck, you can buy a brand new 32-inch TV for under $180 at Best Buy. I've also searched the Roku forums for ways to mirror. It really doesn't exist. One other possibility -- and I haven't tried it, so beware; I'm suggesting it as a possible solution, not a confirmed solution, though Chromecast support forums say it works -- is an HDMI to composite adapter ($20-$30) and a Chromecast ($35). Cast your Chrome browser tab to the Chromecast, which is connected to the TV via the adapter. I think it might work, but haven't tried it (don't have, or need, an HDMI to composite adapter). If it works, call up your little pirate Website and stream it to your Chromecast/composite. Are you sure you guys are speaking English? Right now I get amazon and netflix to my TV through my WII. I don't need one of these amazon fire thingies, do I? If you have a game toy system that gets the content, you don't need anything else. The only advantage might be the interface. But there ain't no interface worth spending that kinda money on. But, for folks that either don't have game systems (me!) or have systems that don't get the content you want, these boxes are cheaper. @20 Anonymiss - Me & my La-Z-Boy are waiting for the sequel: Just Recline. @21 Can I borrow Just Sip and Sleep? I have a cold. Maybe this'll stop the Euro-gasms. Maybe. Now whatever will I do with my time?